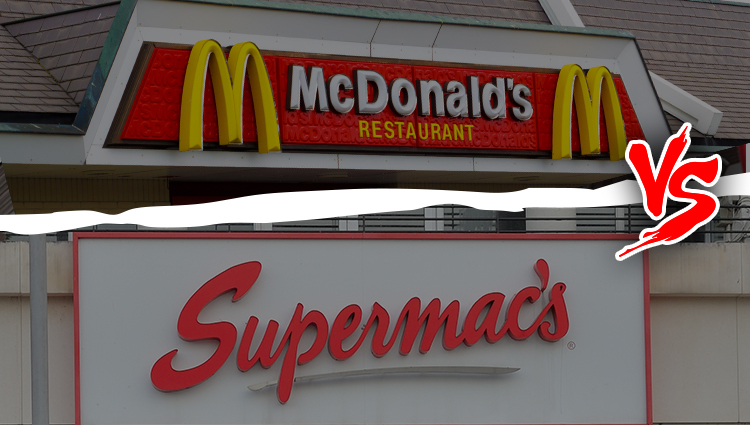 The Irish fast food-chain Supermac’s, named after its director Pat McDonagh’s high school nickname, has engaged in a trademark battle against McDonald’s Big Mac. Supermac has seen McDonald’s as a “trademark bully” who has been threatening its expansion in the EU by blocking its trademark applications based on an alleged risk of confusion with the trademark “Big Mac”, among others. In its defense, Supermac filed an application to have the trademark “Big Mac” cancelled on the grounds of non-use for a period of five years. In an astonishing decision of the EUIPO cancelling the “Big Mac” trademark (EUTM No. 62638) for lack of evidence of genuine use, Supermac has just won this battle. While anyone would assume that extensive use of the trademark “Big Mac” for burgers (“meat sandwiches”) could be considered known by the Examiner and not requiring further proof, this was not the conclusion of the EUIPO Cancellation Division. In light of this decision, we have identified some of the most important factors to keep in mind when putting a trademark to use and collecting data as proof of genuine use in connection with the registered goods and services. Genuine use requires actual use on the market of the registered goods and services and does not include token use for the sole purpose of preserving the rights conferred by the mark, nor use which is solely internal (11/03/2003, C-40/01, Minimax, EU:C:2003:145, in particular §35-37, 43). Extent – takes into account all the surrounding circumstances including the nature of the goods and services, the characteristics of the market concerned, the territorial extent of use, commercial volume, duration, and frequency. The EUIPO was not impressed by the evidence of use that was provided by McDonald’s, consisting of affidavits signed by McDonald’s representatives of different countries, as well as brochures showing the packaging, advertising material, and dozens of websites from different countries showing the trademark in relation to burgers, which all failed to show the extent of use of “Big Mac”. In its decision (14 788 C), the EUIPO reminds us once again that the mere presence of a trademark on a website is not sufficient to prove genuine use of the mark unless this presence is backed up by statistics of the website visitations and orders of the relevant goods and services through that website during the relevant period and in the relevant territory. Affidavits are generally accepted, but if signed by the employees of the company, are given less weight. They are consequently analyzed in conjunction with the additional evidence to determine whether their content is backed up by actual proof. In effect, they do not have much effect in establishing genuine use (which is a very different situation when compared to the trademark practice in some national jurisdiction, for example in Germany and Canada). It is important to keep in mind that the use of the trademark has to be shown in the normal course of trade, which includes the product or service in exchange for a compensation. When putting your trademark to use, ask yourself “will I be able to deduce sufficient evidence which shows that I have used my mark in connection with my product or service?”. What we gather from this EUIPO decision is that evidence such as affidavits, brochures depicting the products, advertising materials, and such, should be accompanied by concrete figures, such as invoices, that show that there is an actual possibility to purchase the product that has been advertised. Finally, the evidence submitted to the Office cannot be restricted, and it cannot be expected that the EUIPO will presume genuine use of a mark even if the mark is renowned. Contrary to what was expected out of this decision, if the extent of the use of a trademark as big as Big Mac has not been taken into consideration ex-officio, then nothing will, and even fame has to be proven. An Appeal is sure to follow, but that makes us wonder, will this be the end of Big Mac era? Since the methods and means of providing genuine use of a trademark are unlimited, it is important to refer to your Counsel for more information and advice on how to sort the evidence and particularly how to present it to the EUIPO. Vanja is a European Trademark and Design Attorney at Dennemeyer & Associates and active in IP law since 2010. Her area of expertise is trademark and design law, international public and private law and anti-counterfeiting. She holds a Bachelor in Communications and Law, as well as an LL.M. in International Law and has acquired experience in various IP issues at the European Commission. Currently, she represents and advises clients ranging from start-ups to large corporations in trademark and design prosecution and enforcement.